The Gillette Tech was notable as the first Gillette razor sold with a solid safety bar rather than an open comb guard. From a manufacturing standpoint, the Tech was the first safety razor made with a guard plate stamped from sheet metal. Previously guard plates had been machined or swaged (die-forged) from stock. This technique was patented as US 2,270,388, filed 9 Aug 1938 and issued 20 Jan 1942, and gave the Tech its characteristic diamond-indented guard plate. This depression stiffens the plate. Some UK variants do not have this feature, and may have been stamped from thicker sheet-metal, or may have been machined or swaged.Gillette claimed the Tech made advancements in 4 "points" of Technology, all of which were widely advertised, including "The ridgid blade support speeds shaving", "Non-skid tread protects face", "Cleans quickly - never clogs" and "Solid bar guard assures comfort". Throughout the razor's production, Gillette positioned the Tech as a low-cost model of it's razor lineup, selling for years for 49 cents for the nickel version, and 98 cents for the gold-plated version.The Gillette Tech was also a common gift to American soldiers from WWII through Vietnam from the American Red Cross in care packages.While typically known and recommended as a mild/beginners razor, many users achieve fine BBS shaves with the Tech. Since there are so many different types of Tech, it can be hard to figure out which variant is which - and when each was made. Achim's spotting guide to Techs can be useful. 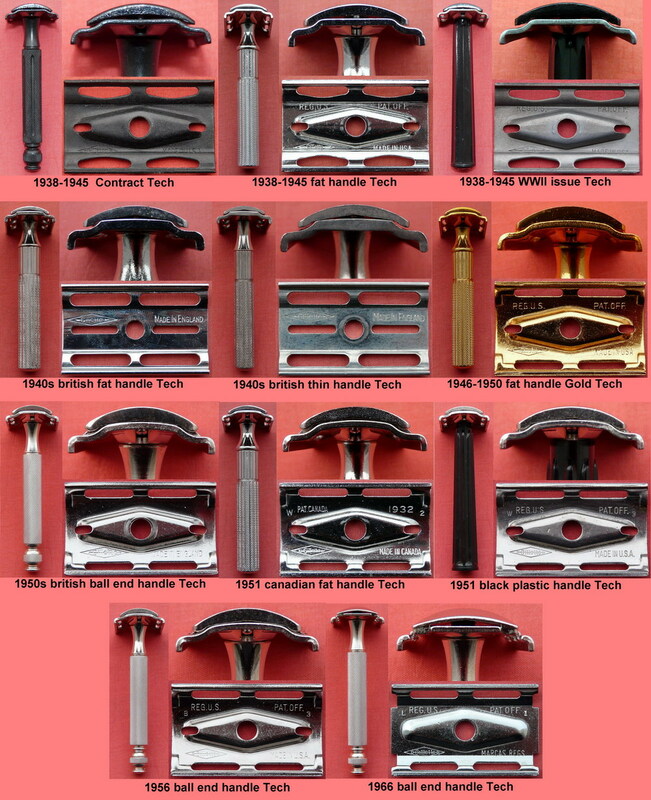 Tech razors before 1950/51 do not have a serial numbering stamping, therefore, determining the exact date is practically impossible, although certain features may indicate a certain range. Description: Three piece design, top blade holder has one threaded prong (for handle). Inside: "PAT. NOS. ON PACKAGE", underside: "REG. U.S. PT. OFF. | Gillette diamond MADE IN U.S.A." Available in silver or gold color. 1950-1953? Models use ferrous metals instead of brass due to Korean War shortages. Models before 1962 are brass handle/stamped brass baseplate & stamped brass guard. Models after 1962 have Zamak caps and can be identified by the embossed "Gillette" name. Description: Similar to Ball End Tech, but barrel has several fullers. No Gillette logo on the guard. Notes of Interest: Made under contract for WWII. Both metal and plastic/bakelite handled versions exist - all metal Contract Techs are ferrous metal-based due to War shortages. The stock number refers to the War Department's predecessor to the National Stock Number system. The stock number also included Tech models with a bakelite handle. The Jersey City Quartermaster Depot was the cognizant contracting office for all soldier hygiene products. This page has been seen 105,641 times.